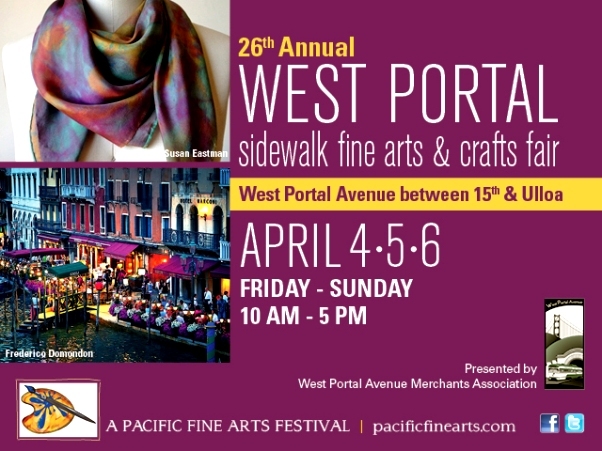 West Portal is having its lovely arts and crafts fair on April 4-6 this year. It’s a wonderful little event, with stalls of art, jewelry, ceramics, rugs, toys, and all sorts of interesting things lining the street on both sides of West Portal Avenue for several blocks. Hopefully the weather will stay fine! I try to go every year, if I’m in town. It’s always got unusual stuff, ideal for gifts; and the size is very manageable. Here’s my story (and pictures) from 2013.